I rediscovered an awesome program a few weeks ago, which I'd like to introduce to you. I first tried proxymitron years ago on Windows 95 and it was incredible. It is a testament to the program that despite not being actively developed for years it's still extremely useful especially if you're interested in surfing anonymously. 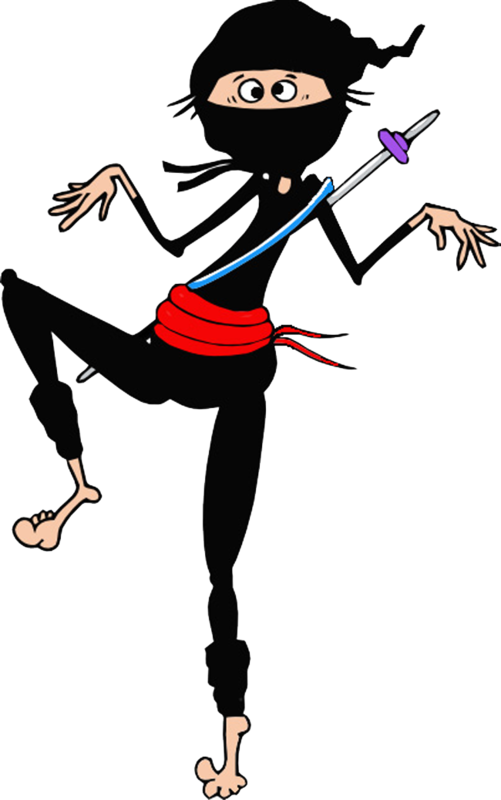 This program is also useful for demonstrating what a proxy server actually does, hopefully it will help people understand what they are doing when using a free anonymous proxy they found on a proxy list! 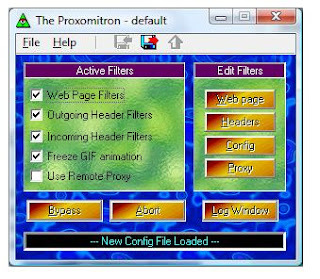 Anyway when I rediscovered this amazing little program it was tinged with a little sadness, the creator of proximitron, Scott R Lemmon apparently passed away in May 2004 aged only in his mid-30s. He was a talented man with a great sense of humour reading from some of his posts. Well basically it's a small but extremely powerful local proxy which allows you to filter your own HTTP requests. That's right you can control what your web browser sends and receives, the proxy server runs locally on your own machine. 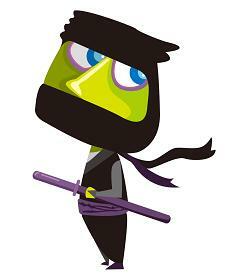 If you notice from the screen shot above, it has a series of filters which can be applied to all your web traffic. Now a lot of the functionality of this program has been adapted into many of the current browsers, but proxomitron was blocking pop-ups a long time before IE and Firefox were ! Here's an example of some of the settings in the default filters, some really powerful stuff. As all your web traffic is routed through this local proxy on your own machine, you can control what leaves, or is processed via your web browser. The filters are your tool to controlling your web experience, it really is a very powerful tool and it's completely free it can help you to surf anonymously too. Just take a look at the logging screen where you get real information about how your browser is communicating for example. Now I'm not going to go into any great detail on this wonderful program, it's something you really have to play around with and learn. 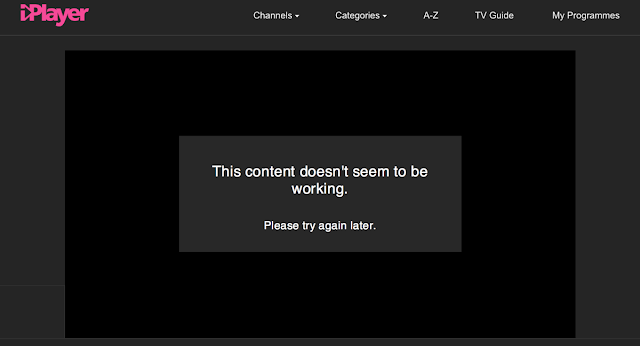 But I'll point out the one thing you must do to make it work and then point you at some links. First of all - here's the proxomitron home page where you can download the program. After downloading the most important thing you have to do is tell whichever browser you are using to use a local proxy - that is proxomitron on your own computer. We do this by telling the browser to look at 127.0.0.1 (which is a special IP address called loopback or local host and always means the machine you are using). 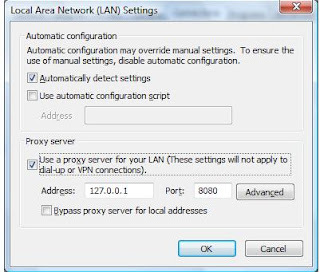 The proxy and network settings are not hard to find, usually in the tools, options menus, here's the screens you need for Firefox and IE. REMEMBER - You'll need to turn this setting off if you want to browse without Proxomitron running. So if you modify your browser to use a local proxy and fire up the proxomitron program, you'll be able to filter and view all the HTTP requests that leave your computer. 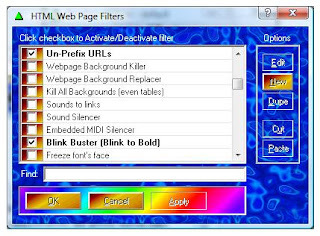 Then use the filters to control your web browsing, you can even create your own new filters. Here's a couple of links for proxomitron information. Hope you enjoy playing around with proxomitron, it really does help you understand what is happening with your web browser when you're surfing and can help you surf anonymously.